Smooth Bouvardia is a member of the Madder Family. The plant grows to 3 feet in height and has dark green, lance-shaped leaves which tyipically grow in groups of three to 3 inches in length. . The plant typically grows along slopes and in canyons at elevations between 3000 - 9000 feet. 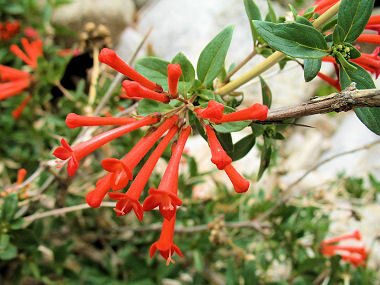 Smooth Bouvardia is a favorite of hummingbirds. Smooth Bouvardia blooms between May - October and produces bright red, narrow, trumpet-shaped flowers which flare into four petals at the end. The flowers grow to 1.25 inches in length in clusters.